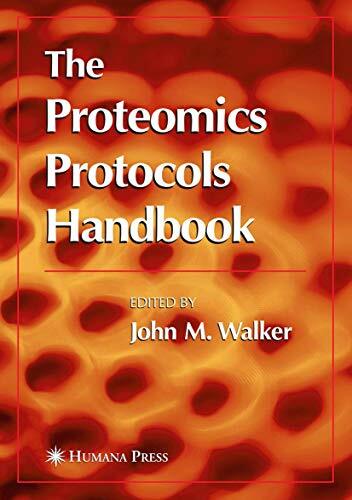 The Proteomics Protocols Handbook: 9781588295934 Paperback - LIMEROCK BOOKS INC.
Proteomics methodology has revolutionized the way that proteins are studied and opened new channels to understanding both cell functions and the cellular changes involved in disease states. In The Proteomics Protocols Handbook, hands-on researchers describe in step-by-step detail a wide range of proven laboratory methods and bioinformatics tools essential for analysis of the proteome. These cutting-edge techniques (73 in all) address such important tasks as sample preparation, 2D-PAGE, gel staining, mass spectrometry, and posttranslational modification. There are also readily reproducible methods for protein expression profiling, identifying protein-protein interactions, and protein chip technology, as well as a range of newly developed methodologies for determining the structure and function of a protein, including novel mass spectrometry and LC-MS techniques, protein array technology, and a variety of structural and functional proteomics techniques needed to determine of the function of newly discovered protein sequences. The use of X-ray crystallography and NMR to determine protein structure is also described. The bioinformatics tools include those for analyzing 2D-GEL patterns, protein modeling, and protein identification. All laboratory-based protocols follow the successful Methods in Molecular Biology™ series format, each offering step-by-step laboratory instructions, an introduction outlining the principle behind the technique, lists of the necessary equipment and reagents, and tips on troubleshooting and avoiding known pitfalls. Timely and highly practical, The Proteomics Protocols Handbook offers molecular biologists, protein chemists, clinical and medicinal chemists, biochemists, and microbiologists a comprehensive collection of today's best tools for understanding not only the function of individual proteins in the cell, but also for identifying new therapeutic targets.